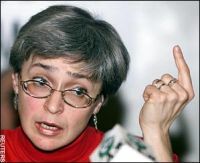 Anna Politkovskaya was found shot dead in her Moscow apartment on Saturday. Politkovskaya was a journalist and longtime critic of the the Russian government, particularly with regard to its policies in Chechnya. She was a special correspondent for the liberal Moscow newspaper Novaya gazeta. The New York Times reported that Vitaly Yaroshevsky, the deputy editor of Novaya gazeta, said that “Ms. Politkovskaya had been at work on Saturday finishing an article for the Monday paper about torturers in the government of Ramzan A. Kadyrov, the pro-Kremlin premier of Chechnya.” Yaroshevsky noted, according to the Times, that “a Makarov 9-millimeter pistol had been dropped at her side, the signature of a contract killing.” Since 1999 Politkovskaya had written many stories about the war in Chechnya, chronicling the killings, abuse, and torture of civilians in Chechnya by Russian soldiers. She was likewise strongly critical of the brutal tactics of the Chechen rebels. An obituary in the Economist catalogs her criticism: She loathed those responsible for the war: the warlords who had misruled Chechnya during its brief spells of semi-independence, the Islamic extremists who exploited the conflict, the Russian goons and generals, and their local collaborators. She particularly despised the Chechen government installed . . .
A recent review by virtuoso pianist and music critic Charles Rosen has much to say about Philip Gossett’s latest work, Divas and Scholars: Performing Italian Opera. Rosen writes for the New York Review of Books: “To my knowledge, there is no other book like it. No one else has treated an important genre of half a century in its social and political setting, its stylistic development, together with a detailed history of its dissemination and performance … Along with occasional indulgence in what the author calls ‘that backstage gossip indigenous to the opera house,’ all this is accomplished in a prose style sensible, often original, provocative, learned, technical but lucid, and always entertaining—and, most remarkably, in only 603 succinct pages.” The review continues: “The achievement was possible not only because Gossett is our leading authority on nineteenth-century Italian opera and the principle figure in establishing the new editions of Rossini and Verdi, but also because he has been actively engaged for some years as a consultant to productions of operas in Italy and America, advising on the problems created by the multiple versions that exist for most of these operas as they were rewritten for different singers in different cities, . . .
Mark Thwaite has an excellent interview with our author, Joseph Leo Koerner, at the online book review site, ReadySteadyBook. 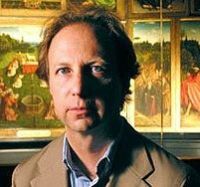 One of the most visible scholars of German art, Koerner discusses his work, including two of his books The Moment of Self-Portraiture in German Renaissance Art and The Reformation of the Image. From the interview: MT: Your first book was The Moment of Self-Portraiture in German Renaissance Art. What was it that was so uniquely important about that “moment”? What does the creation of self-portraits tell us about society and the individuals that make it up? JK: Oddly, if you go back to the moment—the actual historical instant—when the first modern self-portraitist looked at himself and decided to depict what he saw, you find it was not a particularly “momentous” event, at least not for a history of the “self” or of modern subjectivity. Around 1490, the young Albrecht Dürer sketched his hands and fingers because they posed a special challenge to him as a budding draughtsman, and because they were simply there: available models he could pose as he wished. Dürer’s first true nature study is in fact a drawing he did of his left hand just lying there. It’s . . .
William Clark’s most recent work, Academic Charisma and the Origins of the Research University, is one of the first books to take on the daunting task of charting the evolution of academics in the western world. Full of profound insights into the development of the profession, the academics themselves have been quick to praise Clark’s book for its comprehensive and insightful account of the discipline. Sheldon Rothblatt, professor emeritus of history at the University of California, Berkeley writes in a review for the American Scientist: In almost any way that one can imagine, Academic Charisma and the Origins of the Research University is an astonishing book. Earlier reviews have said as much. It is astonishing in style, voice, structure, method, conception, breadth, and learning.… introduces a startling set of new ideas: It was not the professors who created the modern academic profession; rather, it was the rationalizing, bureaucratic, market-conscious functionaries who served the various German states of the 18th century.… This emphasis on the state as the ultimate, if indirect, source of intellectual creativity challenges received opinion, but it also challenges a certain high-mindedness about the pursuit and embrace of knowledge that the inherited account assumes. The corrective . . .
A recent review in The Nation of John Gennari’s Blowin’ Hot and Cool: Jazz and its Critics opens by recounting a fistfight between the legendary jazz bassist Charles Mingus and the critic Amiri Baraka—an image that vividly demonstrates the historically troubled relationship between the musicians that play the music and the critics who write about them. The review points out that short of such scuffles, the musicians have rarely had the chance to turn the tables on their critical contemporaries. 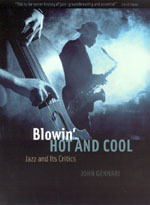 Enter John Gennari’s latest book Blowin’ Hot and Cool, a book that “does for jazz musicians what most of them were unable to do for themselves,” critique the critics. David Yaffe writes for The Nation: “The overall achievement of Gennari’s thoughtful, original and impressive book jazz is not only in need of serious criticism, it is in need of serious criticism of its criticism.… The first sustained scholarly book exclusively about jazz criticism—and, not least, about the passions that have driven and surrounded it—Blowin’ Hot and Cool is thorough, absorbing and original, an obsessive study of obsessives that will circumvent the need for any other.” Touching upon nearly a century of the evolving scene of American . . .